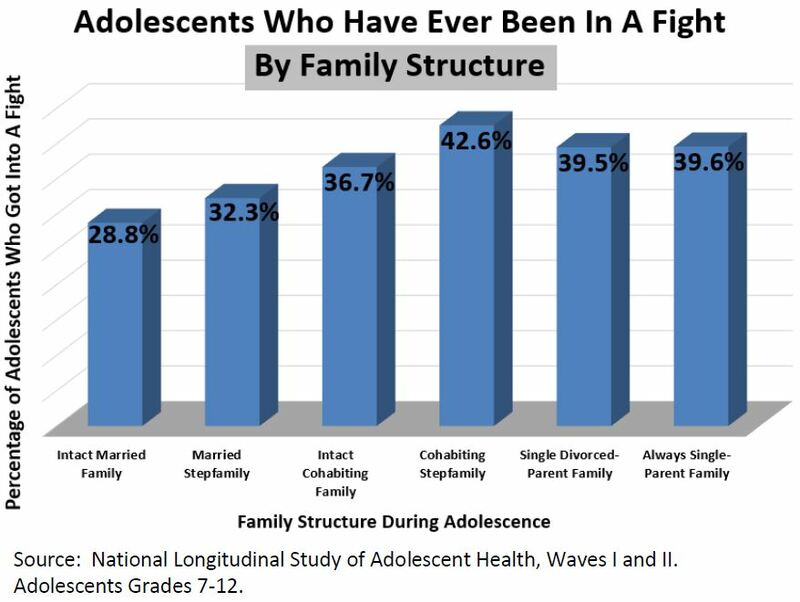 Family Structure: According to the National Longitudinal Study of Adolescent Health Waves I and II, 42.6 percent of adolescents living in a cohabiting stepfamily had been in a fight, whereas only 28.8 percent of children with married parents had ever been in a fight. Among other family structures, 32.3 percent of adolescents living in stepfamilies, 36.7 percent of those living with cohabiting biological parents, 39.5 percent of those with divorced parents, and 39.6 percent of those with never married parents had ever been in a fight. 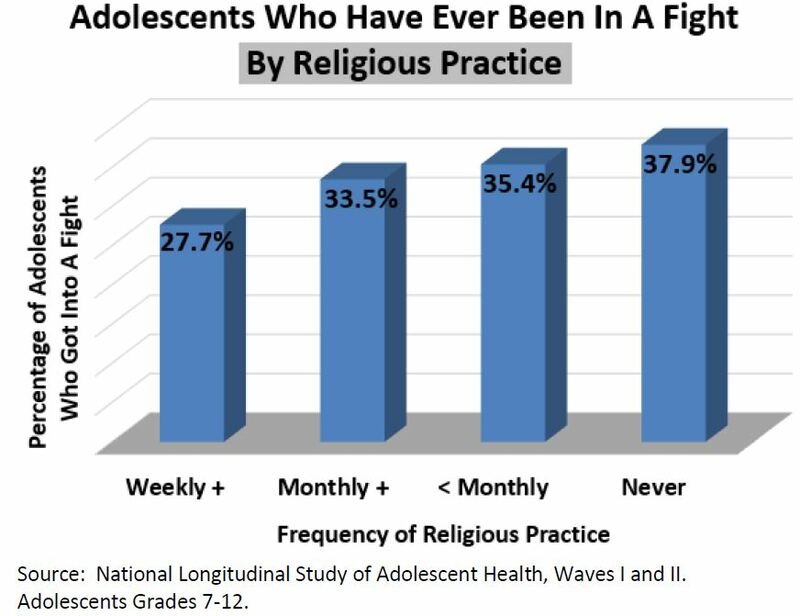 Religious Practice: Waves I and II of the National Longitudinal Study of Adolescent Health showed that 37.9 percent of students in Grades 7-12 who never worshipped had been in a fight, whereas only 27.7 percent of adolescents who worshipped at least weekly had been in a fight. Of those who attended religious services between one and three times a month, 33.5 percent had been in a fight, and of those who worship less than once a month, 35.4 percent had been in a fight. 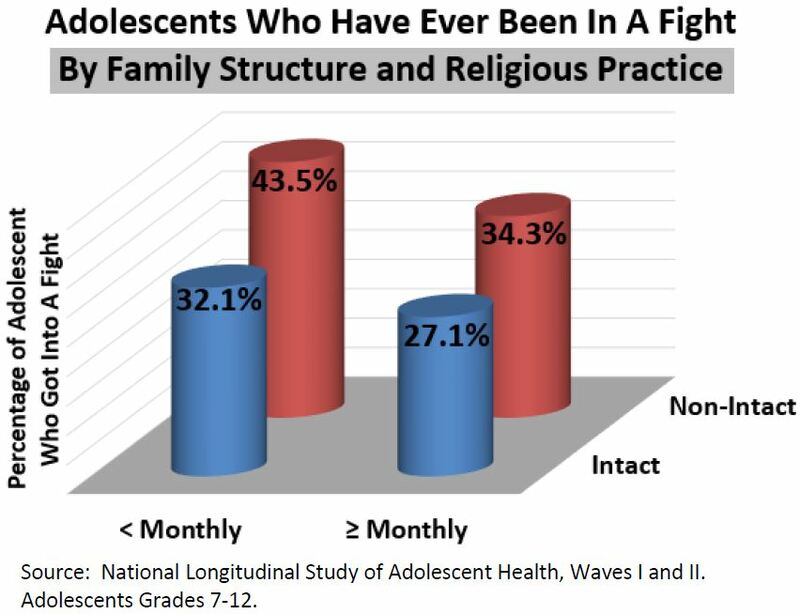 Family Structure and Religious Practice Combined: Only 27.1 percent of adolescents who lived with both biological parents and worshipped at least monthly had ever been in a fight. By contrast, 43.5 percent of adolescent students who worshipped less than monthly and came from single-parent or reconstituted families had ever been in a fight. In between were those in non-intact families who worshipped at least monthly (34.3 percent) and those who lived with both biological parents and worshipped less than monthly (32.1 percent). Related Insights from Other Studies: Many other studies confirm the direction of these findings. Wendy Manning and Kathleen Lamb of Bowling Green State University reported that teens who were more religious had less behavioral problems than other teens. They also found that adolescents living with married biological parents were less delinquent than those living within any other family structure.